Material: Stainless Steel. What will you receive?. 925 Sterling Silver. Necklace Length. Necklace Width. Diamond Information. Resizing and Fees. Vintage Italy 925 Sterling Silver Omega 18 Inch. Condition is Pre-owned. Weak in one spot. Brushed silver effect. Very pretty. Shipped with USPS First Class Package. Beautiful sterling silver omega necklace! 18.5” long, 7.5mm width, heavy at 36.2 grams. This is definitely a statement piece! No kinks, in perfect condition!! Gorgeous 14K Yellow & White Gold Reversible Omega 18" 4mm Necklace. Condition is Pre-owned. Fastens with push button box and hook clasp for security. Last picture depicts a almost imperceptible bend in the necklace. It’s not visible when worn, but pricing is low in consideration of its condition. Measures 18” and weighs 14 grams. Shipped with USPS Priority Mail Padded Flat Rate Envelope. This pre-owned gold-plated. 925 fine silver necklace and pendants remain in excellent condition. The 3 hearts include a 14K yellow gold plated, 14K rose gold plated and '925' silver heart. 14K Gold, NOT PLATED. Material Type - 14k Gold. Stamped with 14K for authenticity. Very unique and strong. You could wear it on its own, or add a pendant/enhancer of your choice. 19" length. These are very small letters, and are nearly impossible to take pictures of. 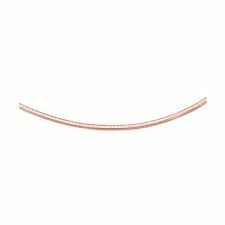 It is a stiff necklace, yet flexible, made to hold its shape. It is heavy, it has lots of silver. 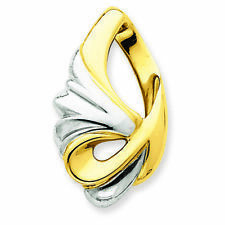 And over the silver, what touches your skin is pure 18K yellow gold. Wear it on its own, or dress it up with your favorite pendant/enhancer. These are very small letters, and are nearly impossible to take pictures of. Very unique and strong. You could wear it on its own, or add a pendant/enhancer of your choice. 19" length. It is a stiff necklace, yet flexible, made to hold its shape. It will lay nicely around your neck, but it won’t drape down, like a chain would—it will have more of a collar effect. We have been provided the competitive prices, highest quality and best services. Plating White Gold Jewelry with Rhodium Has a Major Pro and a Major Con. The Pro is that after It is Plated with Rhodium, White Gold Looks Great. The Con is that You Have to Keep Up the Plating. When this happens the White Gold Does Not Look Good At All as It Does Not Have a Uniform Finish. You can wear it on its own, or adorn it with a pendant. This beauty is made in Italy. Very well made and heavy, lots of silver. Lobster claw clasp. In most cases, you would know whether a jewelry item fits your taste specifications, or not. 14K Gold, NOT PLATED. Material Type - 14k Gold. Stamped with 14K for authenticity. Top Gold & Diamond Jewelry is dedicated towards providing you with the best quality, service, and prices of fine diamond, gemstone, pearl, and silver jewelry. 10 KT Yellow. Screw Off Clasp, Allowing for Pendants to Slide On! Weave Rope Like in Appearance. Fancy Lobster Clasp. CHAIN ONLY. Lovely Yellow Gold. 16" In Length. Also available in 18". 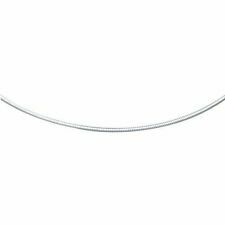 Style: CollarLength: 16 - 17.99"
GORGEOUS STERLING SILVER H E R R I N G B O N E N E C K L A C E. T h i s necklace i s i n excellent condition. 2 5.5 Grams. 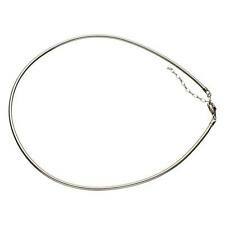 Signed 925 Sterling Silver Graduated Omega Chain Necklace 16"
IT IS STAMPED. 925 ITALY ON THE CLASP. Or dress it up- goes with many outfits! IT IS 17" LONG AND APPROX.1/4" WIDE. -Beautifully presented in a jewelry gift box-. Every facet is luminously polished. Every detail is flawless. This is what Italian production is all about! The feel of these silver chains is truly luxurious. They decadently drape themselves on your neck like gold silk. Material Type - 14k Gold. Clasp Type - Spring Ring. Top Gold & Diamond Jewelry is dedicated towards providing you with the best quality, service, and prices of fine diamond, gemstone, pearl, and silver jewelry. 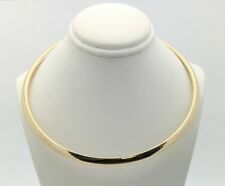 Italy 925 Sterling Silver Wide Flexible Omega Chain Choker Necklace 14"
28.8 GRAMS OF 10K YELLOW GOLD. All of our diamonds are real and none of our gold is plated (unless otherwise noted). We test all diamonds and gold before we list it. These "dark spots" are not on the jewelry. These are so nice to have to wear various pendants as the end easily accommodates most bales. Beautiful piece, and these are not easy to find.